Surf Motel Suites is an oceanfront hotel with 45 suites, each with a combination living room and modern, fully equipped kitchenette. The hotel is located at Wrightsville Beach’s southern end, near the Oceanic Pier. It offers amenities like 24-hour desk service, a pool, and daily linen and maid service. Surf Motel Suites asked Sage Island to redesign its existing website with the main goals of improving both aesthetics and functionality. Surf Motel Suite’s website needed to help the hotel compete in the vacation rental market with several other Wrightsville Beach hotels, as well as with numerous smaller short-term rental properties. As one of the smaller hotels on the island, it needed a website that would help grow its brand recognition as a unique, comfortable and fun place to stay while enjoying all that Wrightsville Beach has to offer its visitors. Our design and development team reorganized the main navigation to match the way tourists typically research vacation rentals. 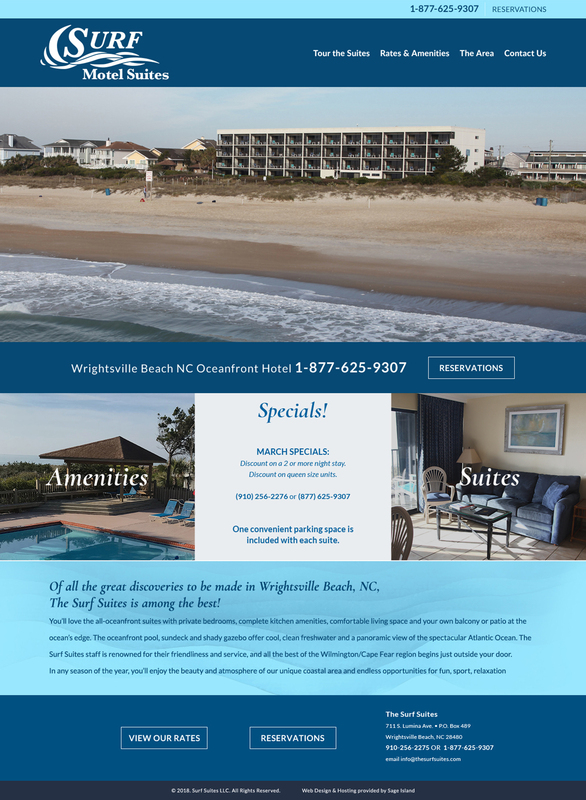 From left to right, we introduced website visitors to the suites themselves, provided information about cost and amenities, touted the benefits of the hotel and its Wrightsville Beach location, and directed visitors to fill out a contact form. On each internal page, our designers placed a full-width header image to draw website visitors’ attention. The images, which depict Wrightsville Beach’s clear water and expansive beach, helped advertise the hotel’s ideal location. We incorporated large calls-to-action on the homepage directing visitors to view the suites and the amenities, or to make a reservation. While the primary menu also linked to these pages, the prominence of the call-to-action buttons ensured visitors could quickly access these three important pages.